Blackburg is in Montgomery County in the northern Blue Ridge Highlands region of Virginia. 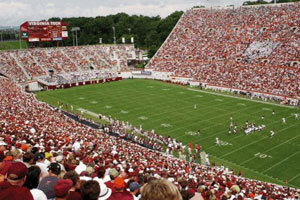 It is home to Virginia's largest university, Virginia Tech. Virginia Tech is located on over 2.2 square miles. The buildings have the old world charm of cool limestone that is quarried not far from the university called Hokie Stone. When you get a chance, check out the sights and sounds of Blacksburg and maybe one of the Virginia Tech football games.